Dragonflies are so inspiring. They are teachers of light. They are teachers of transformation and love. Love is simple. Love can be so easy. Why does it become so complicated? Why does it become so difficult or overwhelming? When does love become a question and not an answer? For many people love is a four letter word and they use it to get what they want and it has nothing to do with the real vibration. We will be pioneering deeply into the real essence of love and what does it really mean? Where does it come from? What happens to women when this love is flowing through them sweetly? What happens to women when it’s not? We will clear away the energy of deception around this and what we may have been taught that love is & really isn’t. The truth is we all were designed to live in the energy of love every day. There is however a huge constriction that so much of our culture is creating and accepting. It’s incredibly sad and we are deeply conditioned by it. During this workshop we’re going to clear a tremendous amount of this conditioning. We’re going to get healings & release a lot of this constriction, which is all full of anxiety, fear and the inability to really listen to the feminine inside of us. What if we had a new conditioning that allowed us to really live in love? Clearly, life is a process and love is a teacher. We are here to remember love, to awaken greater love, to be discerning about what love is and what love isn’t. We are here to remember that we were made in the essence of love and that all we have to do is remember ourselves. As we do, we will blossom in our every breath. Okay, that sounds easy enough! Nevertheless, but we know it isn’t. So join us for tremendous healings. Some fabulous goddesses are going to come & help us wash away the constructions and the limits. 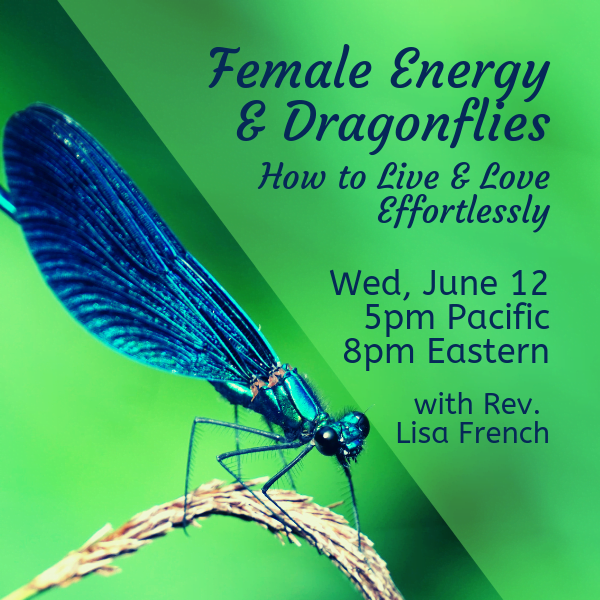 The dragonfly will bring her life and her gift of transformation to help us remember the original essence of our birth as spirit and as woman. Pure radiant love…. So full that it asks for nothing except to be and to grow.